Chances are that you haven’t played Hitbox Team’s debut release, Dustforce. The game was published January of 2012 and sold considerably well, but its stellar soundtrack — also a debut release — remains mostly unknown. Composed by Lifeformed (Terrence Lee), this soundtrack, titled Fastfall, showcases a near seamless fusion of old and in new in musical style and content, and is well worth exploring. Like the central concept behind Dustforce itself–running and wall-jumping through levels to sweep up dust and dirt–this is a soundtrack that never takes itself too seriously. The track listings themselves are indicative of this, including titles like “Fifty FPS Forest,” “Frozen Hot Sauce” and “Cider Time,” just to name a few. Despite the casual nature of the titles, however, the soundtrack itself covers a wide spectrum of emotion, dabbling in nostalgia, melancholy, wonder, mystery, tranquility and — perhaps most importantly in a platform game — speed. Stand-out tracks “Cider Time,” “Swimming While it Rains” and “Electric Relic” evoke a sort of whimsical listlessness, combining slow harmonic rhythms, frequent 7th chords, and habitually fading echoes to lend a nostalgic quality to the sound. The melodies in these tracks, as in others, are often simple and brief, relying more on texture, harmony, dynamics and beat for musical propulsion. In fact, nearly every track in Dustforce features a steady beat, either via a percussion line or repeated chords, but the soundtrack still manages to feel impressively varied thanks to a wide range of tempos and a refreshing gambit of retro synthesizers. Few of the tracks feature anything akin to the sound of a physical instrument, instead embracing an unashamedly chiptune openness of sound. This, combined with the simplicity of the harmonies and the general lightness of texture, gives the soundtrack a sort of cleanliness that fits the game’s subject matter amazingly well. The soundtrack also has a strong sense of stylistic unity, probably due to the ever-present beat, repetition of chords, and fading echoes. Although these echoing beats are strongly reminiscent of dance genres like IDM, they also fit well with Dustforce’s retro sound. 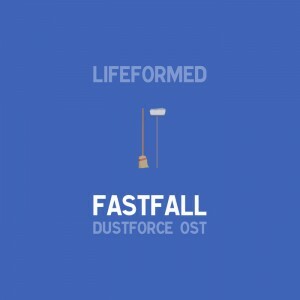 Fastfall -Dustforce Original Soundtrack- is an outstanding soundtrack for all fans of retro game music. Emotive, whole and accessible as it is, it makes for great listening in either the background or the foreground. It’s available for purchase on Bandcamp, as well as free listening via Lifeformed’s soundcloud account and Hitbox Team’s official website. Posted on May 22, 2017 by Stephen Taylor. Last modified on May 23, 2017.
Review stars were entered wrong I think!